ANGLING RULES – We’ve made some changes for 2018 so please read these carefully. PLEASE DO NOT ARRIVE BEFORE 1PM ON SATURDAY. Fishing commences at 2pm and you must leave the lake no later than 10am the following Saturday. BOILIES AND CARP PELLETS ONLY, NOTHING ELSE. NO PLASTIC OR ANY OTHER ARTIFICIAL BAITS. BARBLESS HOOKS ONLY. NO BARBED, NO MICRO BARBED, NO CRUSHED BARBS. We do check. You must use the nets, mats and weigh slings provided, no others. No unattended rods – extra care must be taken when fishing close to snags. Fish care is very important to us and we will explain in detail how the fish must be handled when you arrive. Give the fish 5 to 10 minutes to recover once in the landing net. Take great care of the fish. All fish to be returned to the lake immediately after weighing, applying approved treatments and taking photos. No fish are to be kept in retainer slings. Remove all jewellery before handling the fish (rings, watches, chains, bracelets). 3 rods max per angler. Never pull for a break, contact the bailiff if needed. No braided mainlines, rig tubing is encouraged. Use rigs that are safe for the fish, if in doubt ask. All vehicles to be parked in the designated parking area after unloading and loading gear at the swims. No inflatable boats or similar. Drink responsibly – (accidents that happen under the influence of alcohol are not covered by French public liability insurance). Fishing during lightning storms is not advised and is done so at your own risk. 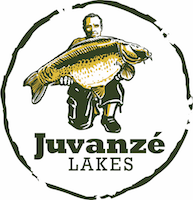 Fishing is strictly limited to Juvanzé Lakes – DO NOT fish the surrounding lakes which are private property. Please treat the site and nature with respect, leave all litter, correctly separated in the bins provided This includes cigarette ends and bottle tops. All unused baits to be taken home, binned or donated to the bailiff. Do not dump into the lake. We reserve the right to terminate your stay with us if we judge your behaviour to be unacceptable to our fish, other clients or any other person or which may contravene our regulations.